A lot of people think they know knee wraps but what they know, oftentimes, are actually knee sleeves and these two are very different from each other. If you’re a professional weightlifter, powerlifter or a trainer, you probably know the difference between the two. But to the non-initiate, these two workout gear are simply the same and bear little to no contrasts to each other. Today, we will help clear whatever confusion might be in the air concerning both products. However, we will be doing a more focused article on knee wraps themselves. Let’s be honest, squats are terrible for your knees. There’s no nice way to put that. But here presents the problem, they are pretty darn good for other parts of the body that you intend to work out. So, what to do? You’ve just got to squat. But since we can’t have you damaging your knees, then you need to get a pair of weightlifting knee wraps, or powerlifitng knee wraps, however you choose to address them. But then, just so we’re clear and on the same page, let’s quickly look at the difference between knee wraps and knee sleeves, so you don’t purchase the wrong item. Knee Wraps: Knee wraps closely resemble wrist wraps and are mostly used by body builders and powerlifters that compete. Typically, they are made of elastic material and you are supposed to use them by wrapping around your knees either in a diagonal or a spiral fashion when doing squats. Many lifters love knee wraps basically because they allow them the opportunity to lift more weight in a squat than they would have lifted without the wraps. There are two phases of a squat, the eccentric or downwards phase and the concentric or upwards phase. Now, when using knee wraps, because of the added tightness they provide, more elastic energy is stored in the eccentric phase. This stored elastic energy comes in handy in the concentric phase when it is released to give faster and heavier squats. When you squat, the tendons around your knees pull on the kneecap. Now, if the stress isn’t reduced on your knees, you can very well detach the tendon from the kneecap or even dislodge your quads. And yeah, both cases are every bit as painful as they sound. Now, for the downers; knee wraps do not necessarily make you any stronger. They are quite restrictive, plus they have to be worn a bit tightly. By wearing them tightly, the friction between your kneecap and the cartilage around it is increased and this can lead to serious injuries, as well as joint diseases e.g. arthritis. Knee Sleeves: Now, these are the more popular ones. You’ve definitely come across them many times. They are usually made of neoprene and they are err… sleeves that you wear over your knees. Knee sleeves aren’t knee braces, so they don’t help with injured knees; instead they prevent the knees from getting injured. One valuable feature they offer, though, is compression. Compression helps to ensure that blood flow around your knee is increased so that there is no risk of swelling or pains after an intensive workout session. Ultimately, you recover faster and you perform better at your workouts. In addition to compression, knee sleeves can also help with the mechanics of certain movements. For instance, they can limit the movement of your kneecap, enhance lateral stability, and also increase proprioception. But they do have their downers as well though. Knee sleeves can cost a pretty penny and they can also get smelly if they aren’t washed regularly. Okay, we’ve established that knee wraps are necessities for weightlifters and powerlifters alike. But there are still a few things you should consider before getting any pair of knee wraps. If you squat under 80% to 85%, then maybe you should put off getting knee wraps for now. This is because it’s going to end up being counterproductive. All the stress that should have gone to your tissues to make them stronger would be absorbed by the wraps. So you’d be spending your time squatting but your tissues won’t be getting any stronger. Only buy knee wraps if you’re squatting anything above 80% to 85% of the maximum weight you lift or if there are problems with your knees that require you to use wraps. Also, you can wrap them loosely around your knees to help keep them warm and improve the circulation of blood around your knees. Now how do you choose the best pair of knee wraps? Now that you’ve got your knee wraps, don’t doubt it, there is a correct way to put it on. Even though the name says “wrap”, it doesn’t necessarily mean that you can just wrap it any which way and expect it to work just fine. The correct procedure is what we will proceed to share with you now. When you’re done, tuck the last part of your knee wrap into the last layer. And it’s a wrap! (pun very much intended). Alternatively, if you’re more of a bodybuilding and fitness person, you could make the wrap tighter at the upper part of the shin, looser around the patella itself, and then more tightly around the lower fourth part of your thigh. ProFitness is a family-owned gym that came into full operation in 1990. Owned by the Burien family, this brand is fanatical about exercise and keeping fit and makes it a point to furnish its gyms with all the state-of-the-art facilities and equipment necessary to run a most efficient place that attends to the unique needs of each of its customers. Its decision to launch into the manufacture of quality gym products and equipment such as knee wraps is in keeping with its brand goals to provide customers with state-of-the-art equipment that help them achieve their workout and fitness goals and, consequently, live a more fruitful and fulfilling life. Keeping fit is wonderful but what’s more wonderful is staying safe and uninjured while you do your business. That’s why when it comes to weightlifting, powerlifting, and the like, you need a pair of weightlifting knee wraps that does an excellent job of giving you that extra stability. 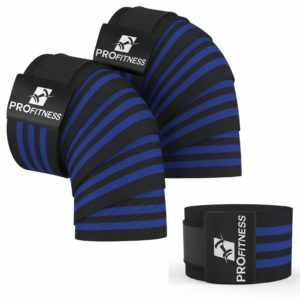 The ProFitness Weightlifting Knee Wraps are a fine example of such quality knee wraps and without further ado; we will go on to see what they offer. This pair of knee wraps comes with super enhanced support and stability which means that you’d have a much reduced chance of sustaining injuries to your knees while you squat, lift or do your CrossFit workout of the day (WOD). And you can lift more as well! Because they come adjustable, you can be sure that you’d never have to feel unnecessarily inconvenienced while using these. They are about 72 inches in length, which is pretty long, up to 6 whole feet! Also, made of elastic, they easily adjust to any knee size or shape. And with the Velcro straps attached, you can adjust the wraps whichever way is most convenient for you. Plus, the straps also help keep the knee wraps in place. And guess what? It’s fine for men and women as well. These slim powerlifting knee wraps offer excellent compression to your knees, ensuring increased blood flow and making sure that you don’t overexert or overstress your knees which can lead to tension or injuries to your knees and joints. And finally, to suit your style, these wraps come in different beautiful colors to choose from. Yes, your personality can shine through even in your choice of knee wraps! DMoose has learned the secret to being and remaining customers’ favorite, and that is to give them the two things that they (customers) prize the most: quality products and affordable prices. But this brand isn’t just about the talk, it’s about the walk as well. And that’s why it only makes products that are amazingly high in quality yet unbelievably low in price. By doing this, DMoose Fitness has amassed a huge population of customers, who might even be better described as “fans”. If you’re in the market for a pair of quality, fancy, heavy duty knee wraps for squats, lunges, and other such moves, then you’re at the right spot. The DMoose Fitness Heavy Duty Elastic Compression Knee Wraps are the knee wraps you want. These effortlessly provide your knees with that extra support and strength to withstand the demands of such active moves and twists while allowing you reap all the benefits of a well worked out body. With even the best knee wraps, you can expect wear and tear sooner or later as a result of the pressure exerted on them with use. However, these knee wraps from DMoose Fitness are different. They last! With their double stitching, as well as the width of the Velcro used on them, you can be sure that they will withstand extended periods of stress without showing any sign of wear or tear. The last thing you want when lifting or squatting is to be distracted by such annoyances as ill-fitting gear. For this reason, the manufacturers have made these knee wraps of a most comfortable fit. They are fully adjustable and they also come with a hook and a loop for a snug fit. The tension provided by the sturdy yet flexible elastic material used in the manufacture of these knee wraps ensures that your knees have all the stability they need to keep you in control as you carry out those power moves. They are unisex too, so male or female, they give an excellent fit. Just simply adjust them to fit your knee whatever the size or shape. And yeah, they are really stylish. There are so many amazing, standout color combinations and variations with this pair, so feel free to do you. Psst! There’s a really dope America II color and a pink camo too for the ladies. Weightlifting knee wraps just got a whole lot more fashionable! Founded by a wife and husband who are fitness enthusiasts, out of a need to have the right gears for the most rigid exercise routines, RIMSports has evolved over the years to become a force to be reckoned with in the sporting goods industry. It all started as a small and personal venture but now it has become a household name. The fact that the venture has grown did not diminish the quality, time and dedication that go into the production of each item. If anything, it has improved, knowing that the brand is out there with so many users depending on it, coupled with the changing times. Therefore, you can rest assured that you will get the best sporting gear from RIMSports, from ankle sleeves to foot rollers and knee wraps, like the RIMSports Best Weight Lifting Knee Wraps. These knee wraps keep your knees safe. No matter how many times you squat or how heavy your routines are, your knees would not feel the effect of the strain. The wraps provide support like nothing else would. Squat and lift weights to your heart’s content and your knees will not have to tell a negative story. They come in super functional pairs. With them, you get a wrap for each knee so you do not have to cut one into two nor spend any extra dollar for a second wrap. Lengthwise, each wrap measures 6 feet and this means that you can wrap them over each knee many times to offer more support. You know, the more times a wrap can go around a knee, the better it works. This fact makes them so powerful. Unlike other knee wraps, these make an allowance to put in extra work, about 10% more room. Powerlifting takes its toll on the knees and if they are not given adequate support, they may give out in the long run. 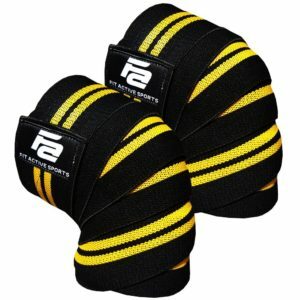 Therefore, these are one of the best knee wraps for powerlifting. This feature also adds to their versatility. They are perfect for use in a number of sports and exercise routines beyond powerlifting like bodybuilding, weightlifting and squats. This means that they are fit to be used for extreme sports and routines without fear of them giving out. Your knees are very well protected. And for the length of time they would serve you, they are affordable. 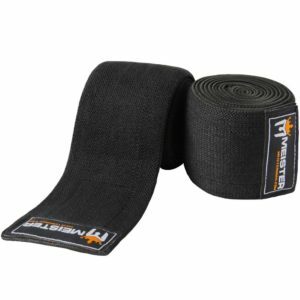 No matter how often you use these knee wraps for lifting, squatting or even sprinting, they would not give out easily on you. They are not items that you would have to replace often so you get value for your money as well as functionality. Mava Sports was established in 2015 but even though it is young, it is a company founded by athletes for the sportsman and those who engage in extreme exercise routines. Therefore, it understands the quirks of every one of its customers and knows what is needed for each time and season. Workouts and sports do not have to be a chore and Mava are here to ensure they are not with products like gloves for a workout and dependable support for the knees such as the Mava Sports Knee Wraps. You are in safe hands when you choose to trust Mava for the supply of your sporting gear. 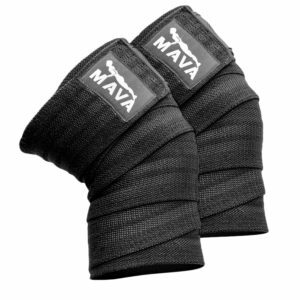 The Mava Sports Knee Wraps come with Velcro straps to secure them. Nothing can be more frustrating than having to keep pulling up your knee wraps into place or having loose ends that you have to keep fastening. These wraps do not give you these problems. The Velcro straps make adjusting the wraps as simple as ABC at any moment you want. Unlike those other knee wraps that do not allow for adjustments, the tension that comes from them does not have to overwhelm you just because there is no room for adjustment. They are heavy and strong, not light and flimsy. Knowing that weightlifters and bodybuilders need all the right equipment they can get to ensure they remain safe, these knee wraps hold out even under the most intense stress. They are perfect as a knee compression wrap because they keep your knees steady and fit and give you the balance and support you need during your routines. These are also some of the best knees wraps for squats since a lot of work goes to the knees during squatting. No further need to stop working out because your knees cannot take them anymore. Even if you have been having problems with your knees due to intense workout routines or sports, using these wraps would reduce the discomfort and give you the relief you need. And if you are particular about colors, then you should know that you can get these in a variety of colors. They have been made with the thought some customers may like vibrant colors while others may veer towards muted tones. You can get them in red, blue, yellow, gray, white, black and even green. There is nothing wrong with looking good in your fitness gear. Best of all, they are all the same price. Looking for that brand which would provide the extra support that cannot be found elsewhere? Then you have come to the right place. At Fit Active Sports, you get that extra help and support you need to go the extra step toward your goal. It does not just provide you with fitness gear like everybody else; it gives you an edge that would give your speed, confidence and strength a boost. What else can you ask for? Even though it is relatively young, setting up shop in 2015, it has set itself up as a name you can trust. From workout gloves to elbow sleeves and knee wraps such as the Fit Active Sports Knee Wraps, you know you are home. Look no further and you are welcome. From squats to weightlifting, cross-training and other intense exercise routines, these knee wraps have got you covered. In sports and exercise, every part of the human body is involved but the knees are some of the pivotal points that you just have to watch out for. Giving them an extra burden through the sports you engage in would not hurt but there has got to be a support system. This is where these wraps come in. They are some of the best knee wraps that are available for athletes because they give the support you will not get from most knee bands, braces and sleeves. That is a pair on steroids. The loop and hook feature eliminates the possibility of loose ends popping up in the middle of an intense routine or during a competition. Little else is more irritating and worrisome. 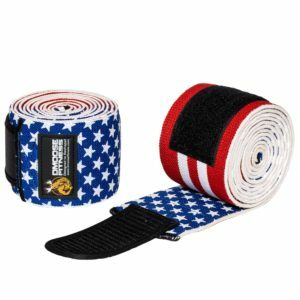 But with these knee wraps, you have the room to run them several times around your knees and fasten the ends to a Velcro strap. 72 inches of stretchable elastic gives more than enough allowance for adjusting to the right tension for whatever purpose you have. Tight or loose, you are good to go. What’s more, you have a number of attractive colors to choose from, ranging from blue to white, all combined with black. They may look conservative but matched with other fitness gear from Fit Active Sports, you would come out looking great. Starting out as the go-to brand for top quality training belts and skating gloves 30 years ago, Harbinger has grown over the years and has gotten into the production of other fitness and weightlifting accessories to fit the needs of all fitness enthusiasts like a T.
The brand manufactures and distributes to more than 70 countries all over the world, making some of the finest gear like braces and knee wraps such as the Harbinger 46300 Red Line 78-Inch Knee Wraps, with a unique technology and design. Any product you get from Harbinger “has your name” because they are all made with you in mind. 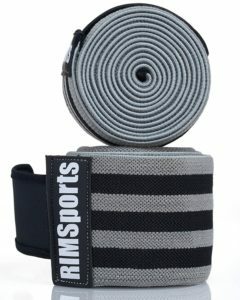 The 78-inch length of the wraps gives you room to make several loops around your knees before securing them. The more loops you can get out of each wrap, the thicker and surer the protection you can get out of them. The length also makes it possible for you to get creative with the style of wraps so let your creative side out with these wraps while protecting your knees. The width of each wrap is 3 inches and the fact that they are elastic allows for adjustment. You can either make them tight or loose, depending on the occasion. The use of an elastic material means that you can still flex the muscles of your knees without feeling any pinch. A more rigid material would not let you do this. So the generous width and the elastic fabric give you support and confidence to build your strength and muscles without incurring any undue injuries. 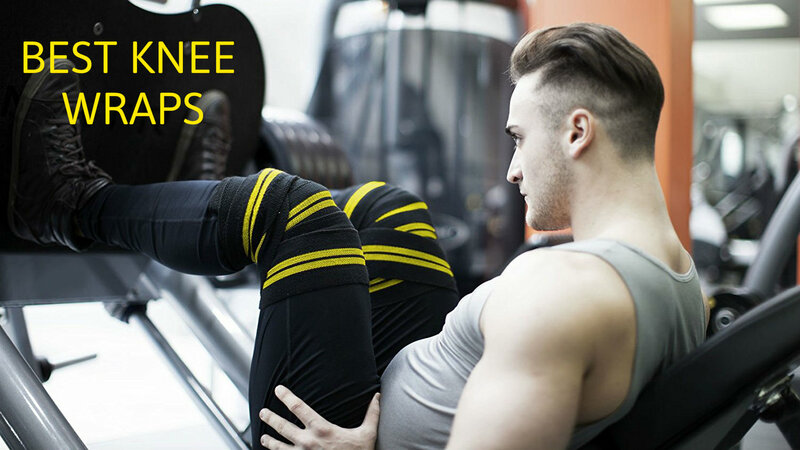 You can put them to work in an intense exercise routine or in weightlifting, bodybuilding, powerlifting and it can serve as one of the best knee wraps for squats. A workout session does not have to be a chore or stressful anymore. Combined with other great fitness gear from Harbinger, you can go an extra hour, an extra day and an extra step to that mark you have set for yourself. Nothing holds you back from using them for various purposes so there is no use spending extra money on knee wraps for specific sports. You even get a warranty for 90 days when you buy them. Just in the event, they do not hit the mark quite right for you, you have a three-month window to return them and get a full refund. That is ample time to ship, test and send back if you have to. It does not get better than that. Minnesota-based Meister was born in 2006 and has since been a well-known brand in the production and distribution of custom-made fitness and martial arts gear for well over a decade. Its sports gear design are exclusively sold, produced and designed by its employees with the aim to assure the customer of quality and durability. If you are familiar with renowned fighting organizations, then you must have seen a couple of Meister gloves on the wrestlers’ palms. Its shorts have also been featured on the MTV show, ‘Caged’. Meister remains a stickler for quality, durability, and affordability. Arthritis, bad knees, and injuries to the knees no longer have to deprive you of being able to take long walks and make some squats every other day because of the Meister MMA Power Lifting Knee Wraps. 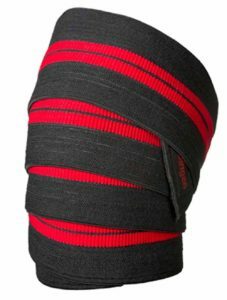 Even aging knees can stay in the groove when properly clad in these knee wraps. And when you make an order for this particular one you actually get a pair – one for the left knee and the other for the right knee. We know it could get really frustrating to wake up one morning and not be able to work out and squat the way one did. That is why we recommend this wraps for your knees. These wraps feature a unique loop with wrap design that allows you keep them firmly in place around the knees. They are also made from elastic but reasonably thick materials that hold your knees in place but allow you lift or squat however you like. What’s more? They are well-designed to give support to your knees and also stabilize them so that you don’t end up with injured knees even during strenuous or rigorous activities. The fasteners also allow you achieve the level of support and wrap that your body requires so that you remain comfortable and injury-free. They measure 72 inches in length and can stretch a little further and firmly over your legs. If you don’t want them stretched over the entire length of your leg, you can fold them up to your desired length. These wraps also come in pairs of black, black/pink, black/orange, and black/red colors. So you can feel free to pick the pair with the color that appeals to you. Looking for the best knee wraps for squats? Choose Meister’s knee wraps. When it comes to physical health one brand you will be pleased to check out is Cap Barbell. With a wealth of experience spanning 25 years as a leading provider and distributor of fitness gear and equipment, you probably don’t want to pass upon the trust and commitment this brand is ready to give you. It boasts 30 categories of over a 1,000 different products that have received great commendations. This extensive line of products includes medicine balls, storage racks, weight training and fitness equipment, plyometric boxes, and inversion tables. Its goal is to ensure that whether you are a retailer or a consumer, whatever you get is of high quality and is offered to you at a very affordable price. The best knee wraps for squats are sold by only a few reputable brands and the few include Cap Barbell. Cap Barbell offers its pair of elastic knee straps that are best-suited for weightlifting, squatting, leg presses, and workouts. 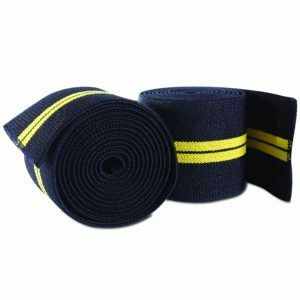 This pair of wraps has a navy blue color with two yellow stripes down their 72-inch length. This length provides enough wrapping-around and some excesses that can be tucked in to make the wrap firm on the knees. 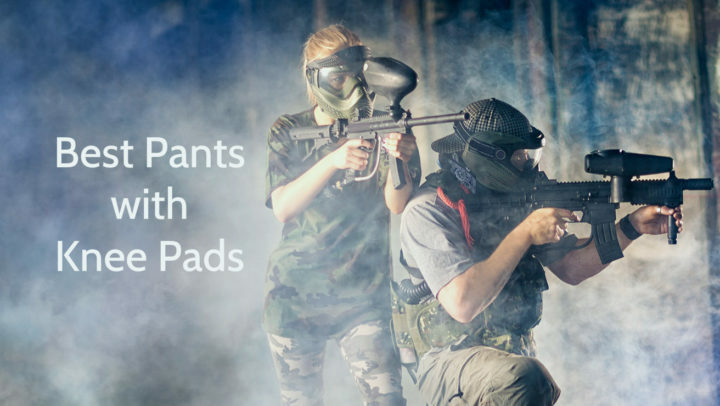 They are not extremely tight like some cheap knee wraps but offer medium-range firmness so that they don’t fall off during rigorous activities. These wraps are designed to support your knees and keep them shoved out during a lift. When properly wrapped around the knees, the wraps do not make the legs hurt or tingle even with 10 to 20 reps.
Those who have patellar tendinitis can relate to the pain that comes when the knee buckles during front and back squats. But those who have tried these wraps can testify to the ease and comfort that comes with wearing them. So, they look forward to subsequent squatting sessions where their knees are clad in these wraps and move as directed without the usual pain. Heavy-duty? Check! Comfortable? Check! Long-lasting? Check! So what exactly are you waiting for? A genie? No way! So place an order right away. Harbinger was founded by entrepreneur and fitness enthusiast David McCrane in 1988. It has since grown to be a trusted brand for many strength trainers and weightlifters all over the world. Its pioneer product, Wrist-Stabilizing Glove was designed to prevent wrist injuries to skateboarders but eventually became very relevant to weightlifters. A partnership with an Olympic bodybuilder who had won the Mr. Olympia award 8 times (Lee Haney) eventually resulted in the Harbinger that now produces high quality and carefully designed belts, straps, speed ropes, wraps, gloves, and bodybuilding accessories. 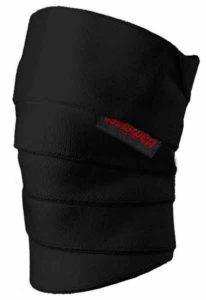 The Harbinger Power Knee Wrap is made from a synthetic material that stretches but remains firm around the knees while you go about your workouts or weightlifting activities. It offers ample positioning during intense workouts and establishes stability during the exercise. It comes as a pair of really nice, soft, and somewhat stretchy wraps so that you can have one on your left and then on your right knee. The pads allow you make squats, lift weights, and make smashing workout moves comfortably and easily. And while we can’t really vouch for their effectiveness on arthritic knees, we can tell you for free that they provide the much-needed support for weak knees (especially those belonging to folks who have acute knee tendinitis) and also prevent injuries on the knees. Moreover, knowing that it is made from a durable material gives one the confidence that there would be no replacements for a while. With a 72-inch wrap on each of your 2 legs, you will agree that that’s enough length to support the knees. Once you are done wrapping the knees, you can take what’s left and tuck it in to hold the wrap firmly in place. If you lift weight quite frequently, say around a thousand pounds, you know you shouldn’t try it without a pair of powerlifting wraps, right? For all it is worth the catch may miss the latches and the weight could crash down on you. The only bridge between you and a useless pair of legs will be knee straps. By the way, if you have been lifting weight without wraps, you know you are sitting on a ticking time bomb. So do the needful already! Then again, if you are looking for that perfect pair of squat wraps, search no more and look no further than these ones that are being offered by Harbinger. Gymreapers is a leading manufacturer of sportswear and equipment in America whose products are primarily for the everyday athlete. Even with its decades of experience, this brand keeps pushing the boundaries for innovative products in the world of athletics. Gymreapers’ mission is focused on revamping workouts as you know it. It also aims to improve the much-needed support required in sporting activities by using quality materials and placing a lot of emphasis on comfort and functionality. If you are looking to relieve pain, improve performance, or add stability to your routines, this brand is ever willing to meet your needs. 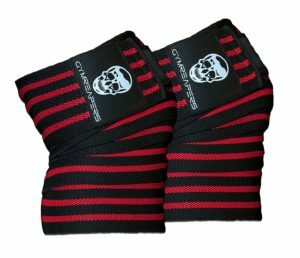 The Gymreapers Knee Wraps are regarded as Olympic weightlifting knee wraps that will allow you do a wide range of sporting exercises with ease and comfort. You can now do your squats and leg presses as well as any other leg activity you’d like to participate in. These wraps are designed with precision to provide stability and support for the legs while boosting the strength of the legs. They are perfect protection for the knees joints and will help to improve your workout performance. Heavy weightlifting, for instance, may put you at a risk, but wearing these wraps will secure your knees and prevent likely injuries from the sport. These wraps are also suitable for cross training, powerlifting, squatting, and bodybuilding activities. This is one popular 72-inch knee wrap that is made from a customized elastic material so that you have no problems with keeping your knees in the wraps. If you’ve been unable to push boundaries and achieve your personal goals till date because of a repaired MCL, an arthritic knee or anything of the sort, then you should place an order for these wraps right away. With them, you’ll be able, squat more, to lift some more, build more and break those barriers. By the way, the ultra-durability of the unique stretch blend and elastic support is proof that you’ll be using these powerlifting straps for a long time without bursting seams or tearing sighs due to intense workouts. What if these wraps surprisingly turn out to be what you don’t want? Well, that’s very unlikely. But… if it happens, Gymreapers backs every order up with a full refund guarantee. So, if you are able to return an errant pair to the vendor within 30 days of the order delivery, you’ll get every single dime you paid for it back. Either way, you lose absolutely nothing! Now you know, knee wraps are not knee sleeves and knee sleeves are not knee wraps. 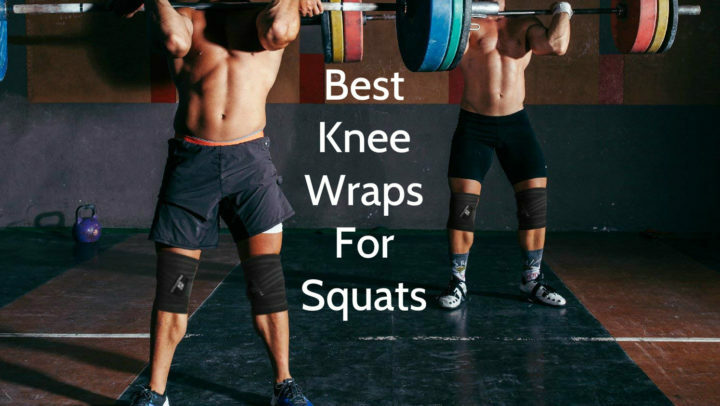 In our comprehensive guide, we’re pretty sure we’ve wrapped up all you need to know about getting great knee wraps for squats and we’ve tied it up with a bow by providing you with our own selection of top ten products, all with varying prices and features that you can choose from. Now, go ahead and get that body ripped, but hey, don’t forget to look out for your knees!